If you're craving stuffed pasta but looking for a healthier option, stuffed zucchini is a perfect substitute. 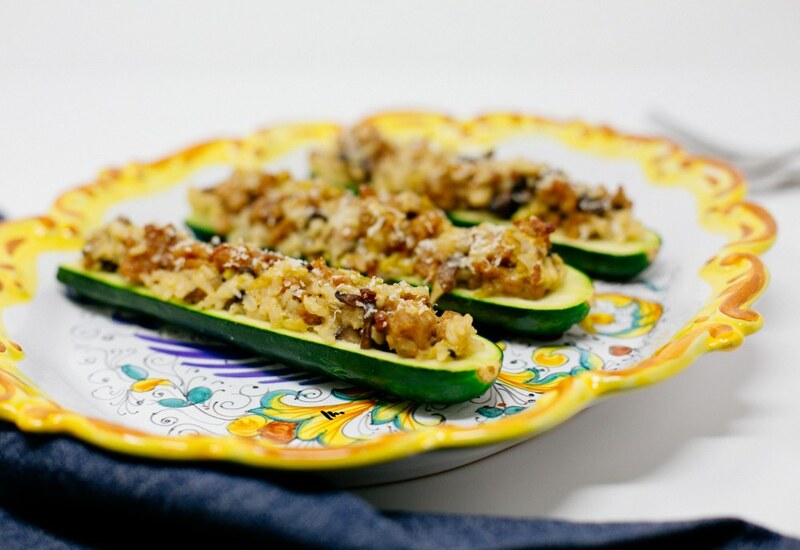 In this quick and easy recipe, halved zucchini is stuffed with a fiber-packed mixture of ground chicken sausage, cremini mushrooms and brown rice. Binding the stuffing together with eggs results in a creamy texture and adds protein. Melting a little Parmesan cheese over everything at the end makes the stuffed vegetables feel a little indulgent, but you can feel virtuous knowing that the dish is actually low in carbohydrates and full of nutrients. Vegetarian? Swap the sausage for crumbled tempeh and add 1 tablespoon ground coriander to get a the same flavor profile. You can also make it vegan: use tempeh as above, omit the cheese and stir in 1/4 cup instant mashed potato flakes to replace the eggs. Per Serving: 579 calories; 28g fat; 37.2g carbohydrates; 46g protein; 212mg cholesterol; 1409mg sodium. The filling was fantastic! I could eat this solely with just the brown rice and meat. I wasn't a fan of the zucchini boats as it didn't seemed cooked enough. The zucchini felt stuck in limbo between heated on the outside, but kind of raw on the inside. My friend however liked it though, but said the same thing- the filling is just fine on its own. If I make this again, I will try to cook the zucchini first in the oven for a little bit before adding the filling to bake again. These zucchini boats were really good. I've made them twice already, once with sausage and once with ground turkey. The mushroom, brown rice, and onion were a nice addition. The best part was that it took only 30 minutes. I didn't use chicken sausage, but instead opted for ground chicken. It was tasty, but I had to cook the zucchini for closer to 25 - 27 minutes. Shredded cheese on top was perfect. I love that the zucchini meat is added back to the zucchini via the delicious chicken sausage mixture. Great for a healthy weeknight dinner. I forgot to add cheese, so I put it on at the end and popped them back in the oven on broil for a couple minutes. Made this with turkey sausage and skipped the mushrooms. It was super yummy! I might try this again with spaghetti squash.